We are accredited by the Victorian Farmers' Market Association (VFMA). We attend the Eltham Farmers' Market every Sunday. Send us an e-mail or call us if you would like to make sure we have the plants, seedlings or veggies that you would like. 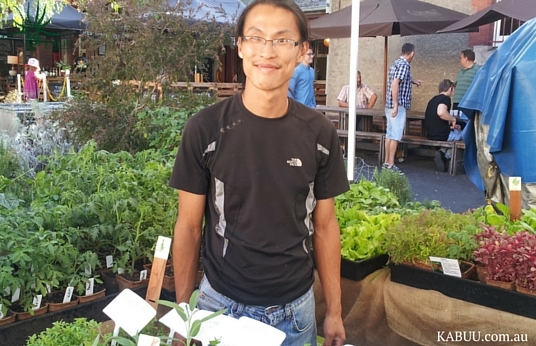 We also attend accredited Farmers Markets in Melbourne throughout the year depending on season. For more information and up to date details, follow the links provided to find out if we are attending. Look for KABUU in their stallholders list for the up coming market dates. The Eltham Farmer's Market is our local market. This lovely market is run by the not-for-profit organisation, Local Food Connect. When: Every Sunday. 9 am to 1pm. Where: Eltham Town Mall car park. 10-18 Arthur St, Eltham, VIC.